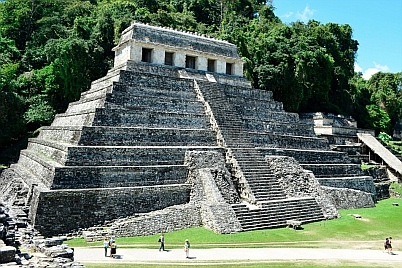 Palenque – Ancient Mayan Ruins and Terror in the Jungle! Valley farmlands between San Cristóbal and Palenque. Lush mountains behind corn fields. Palenque is closer to the Caribbean! Back streets to Palenque town. Vendors sell trinkets on shaded blankets before the Palace. A ruin yet to be excavated and studied. The Palace, a building worthy of a great king. Bas-relief sculpture shows what the Mayans looked like. Left unattended, the jungle always wins. descended into the thick, hot, humid jungle. Caribbean than the Pacific, our home for the last six months. amazed at all the new-to-us plants and flowers we saw. added to the exotic feeling. about spending a few days in the rainforest. everyday items like shoes, clothes, and electronics, and the uniformed school kids hung out in Burger King in the afternoons. the music poured out of every storefront in classic Mexican style, thumping modern pop tunes and loud Mexican songs. on. He turned around a few times and wiggled to see if they'd slip. finally said in exasperation to the group crowding around us. "No jobs!" Fair enough. Mayan culture here was on the rise and not yet peaking. hidden in the surrounding jungle. Inscriptions. Unfortunately visitors aren't allowed inside. quickly swallowed up by plant life. agape, huge canine teeth bared. behind him, my heart in my throat. unmistakable rock wall of an unexcavated building. What a cool place! structure, and we wandered freely through it. vent, blowing a continual stream of cold air up from the stone rooms below ground level. also shaped like a T.
the area, it wasn't until 1831 that one Juan Galindo wrote of the resemblance. fell, sometime in 10th century, almost six hundred years before the Spanish arrived. walls that echoed in our souls. ruins of Yaxchilán & Bonampak. Find Palenque on Mexico Maps. This entry was posted in Inland Mexico and tagged Ancient Ruins, Chiapas, Chiapas-Inland, Inland Mexico, Mexico, National Parks Mexico, Shutterbug, Travel by Roads Less Traveled. Bookmark the permalink.